In 1972, Mr. D. N. Kathuria took the first step with a vision of building an Engineering Unit of his own to manufacture Precision Sheet-Metal Parts with highest degree of Quality, Reliability, Technology and Customer satisfaction and started VENUS METAL (REGD.) as first venture to serve Industry and Society at large. Mr. D. N. Kathuria made a management philosophy aiming at total customer satisfaction with a conviction of service and quality as major role player towards success. His clear vision and leadership have been driving force to achieve excellence in business results. Today, VENUS GROUP OF INDUSTRIES is not only a recognized major supplier to Automotive Industry but Udyog Patra & Udyog Vibhushan Awards are to the credit of Mr. D. N. Kathuria. It was his vision that transformed into success and become reality. 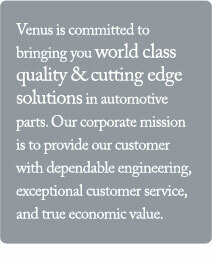 VENUS group is proud to be a major and preferred supplier to the Indian Automotive Industry, Electrical and Allied Industry, Electronics & Computer Industry and many others. An integrated and efficient manufacturing system covers a whole range of plant operations from planning and design to final production to provide "Total Service". The importance of manpower as a resource for development is truly understood and appreciated. The group's bedrock of excellence, its manufacturing system is supported by product design, tool design, tool & die manufacturing, press working, welding, painting, assembly and a well equipped test center. Innovative ways of mechanized assembly with the human touch result in excellent performance of assembly lines. All other manufacturing systems are regularly reviewed for value analysis and value additions engineering. Back-bone of the manufacturing system i.e. Tools & Dies are developed from the Drawing Board to Tool Shop floor for consistent conformance to specifications. Metal Stamping, Pressing and Fabrication of critical components to exacting tolerances is done with high level of discipline and skill. Painting is the other area where quality is constantly of high trade to provide full value of money to its customers. All its products conform to the standards demanded by the customers. 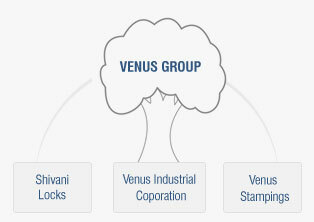 The Venus Group's Quality Assurance System is reflected by its ongoing commitments to total quality, its resources, and training by its people. Continuous improvements, solving problems, identifying needs and creating opportunities have become the way of life of its product specialists and Engineers.